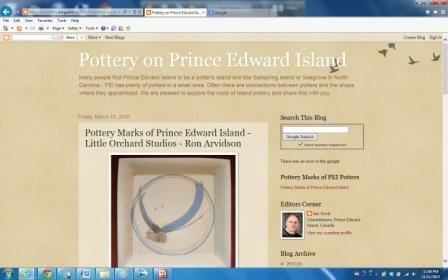 studioceramicscanada.com has published a new page Pottery on Prince Edward Island. Not all collections are physical, material. This one is virtual, a website. The collection is of particular interest in that the publisher, Ian Scott, has also had the foresight to document artists’ signatures and marks. This is a gift to collectors and researchers. If only more organizations,sites and publications would do the same. Identification and collecting would be so much easier. This entry was posted in Pottery, Prince Edward Island, Signature/Mark/Chop, Studio Ceramics Canada and tagged mark, PEI, Pottery, prince edward island, signature on November 12, 2013 by Barry Morrison.